And on the 10th Day of Christmas Cookies I made my Dad’s favorite. We weren’t a big “fudge” family, but I do recall his love for Penuche! As a young girl I didn’t understand why he liked it so much, since there was no chocolate in it. I guess I just figured it was a “grown up” dessert, like his love of Mincemeat Pie. 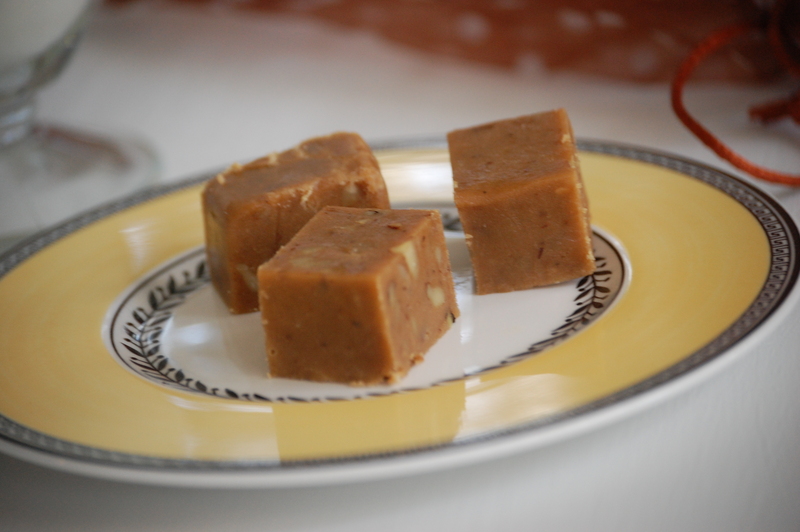 I might not have understood or like Penuche back then but that story has changed for sure! 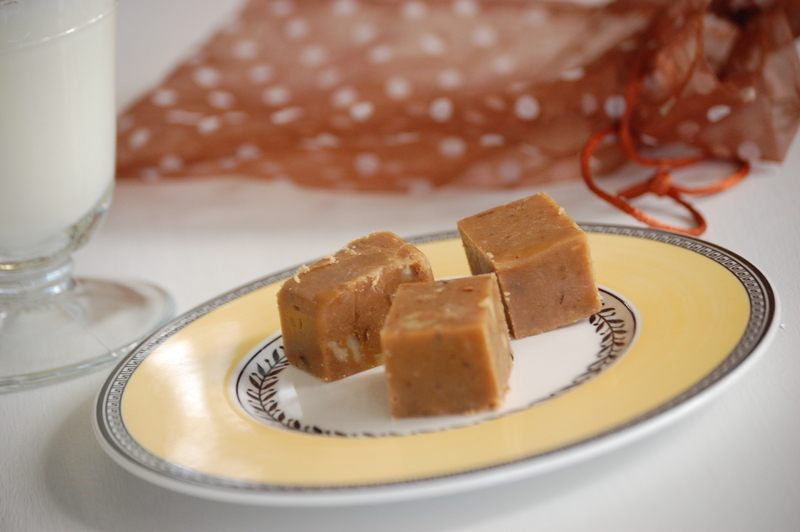 Penuche Fudge has butterscotch and maple overtones, due to its caramelized brown sugar. You can leave the walnuts out if you prefer, but they really do add a great texture. Seriously melts in your mouth! In a large saucepan, mix sugar, milk, butter and salt. Cook over medium high heat, stirring until sugar is dissolved. Allow it to cook until 238 degrees registers on candy thermometer*. Remove from heat and let stand until lukewarm, 110 degrees. Add vanilla and walnuts. Beat until mixture is thick and loses its gloss. Pour into buttered 9 inch square pan. When firm, cut into squares. *If you don’t have a high temperature thermometer another trick is to determine when the candy has reached the right temperature is to take a small amount of mixture and drop it into cold water. If it forms a soft ball you are in ready to remove from heat. No chocolate, but it's still got dessert "cred"! 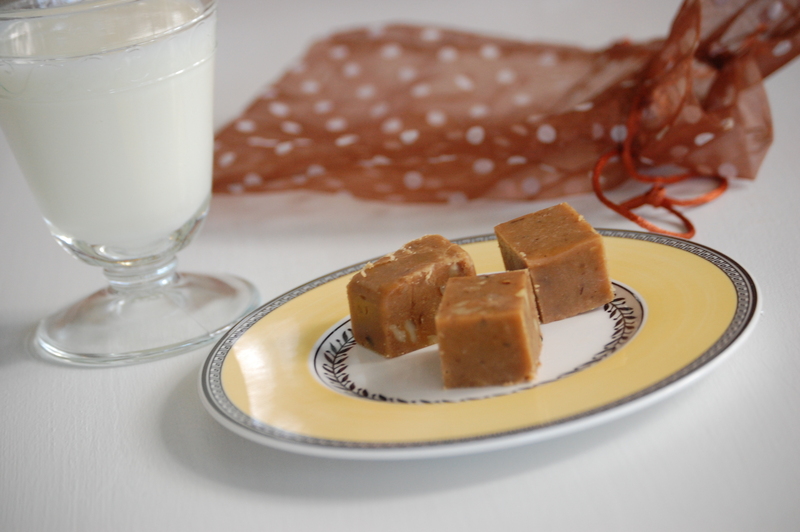 Fudge is pretty easy to make- it’s all about cooking the candy to the right temperature. After that it’s simple!! This entry was posted in Christmas, Cookies, Holidays, Recipes and tagged 12 Days of Christmas Cookies, fudge, penuche. Bookmark the permalink. Heck with your dad, I’m eating it all! I have never heard of this flavor at all, but all fudge is good fudge, so I am sure this is no different. Looks great!